As autumn wraps us up in serious brrrrr, the tendency is to shut down and retreat into ourselves – physically with hands stuffed deep inside pockets, shoulders raised up around the ears, head hunched low against the drizzle, and emotionally because the colder months are prime introspection time. And while this is all well and good – we NEED this yin down time to recuperate from summer’s yang – it’s important to keep the cockles of the love factory warm and glowing so we can beam our light into the world and follow our heart chakra to our happy place. And we can’t always drop into a heart-yawning full wheel at the bus stop. One of the easiest ways of keeping your heart chakra open is to walk with your heart/ navel, rather than your head. Our tendency, especially in the cold, is to lean forward when we walk. Notice how you lead with your head? 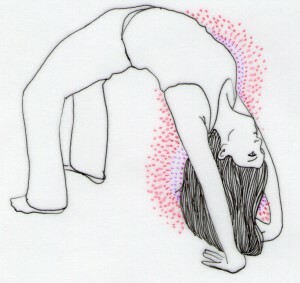 Drop that drive down into the navel and lead with your abdomen instead. Imagine that there’s a rope looping through your belly, about 2cm below the belly button, that threads all the way through to the small of your back and is tied into a big, strong knot there. Now visualise someone (AKA the universe) leading you by this rope. Your abdomen is the first to feel the pull, and the rest of you follows. Not only is this GREAT for your posture and engaging your core as you walk, but your subtle self with follow the lead of your physical self and before you know it, your heart and navel will be leading the way in life – a much safer bet than your monkey mind calling the shots.